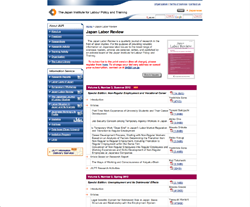 The Japan Labor Review, launched in January 2004, is a quarterly journal of research in the field of labor studies. For the purpose of providing valuable information on Japanese labor issues to the broad range of overseas readers, articles are selected, edited, and published by an editorial board of the Japan Institute for Labour Policy and Training. Current and past issues are all available on the JLR website. The Japan Labor Review is distributed free of charge. (However, in some cases the receiver will have to pay for postage.) To receive the journal on a regular basis, complete the registration form.